Astrophysics simulations are massive, hulking beasts, with most of them being massive code bases, such as flash or ZEUS. These simulations code can accommodate a variety of cosmological evolutions, but that's a story for another time. 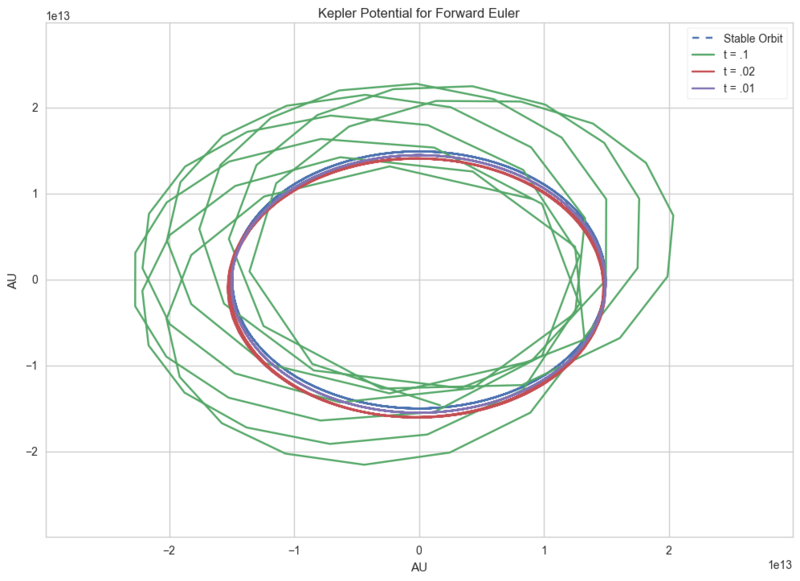 In this post, I'll describe how to evolve the orbit of the Earth around the Sun in a ten year period on a 2D plane by writing a very tiny astrophysics simulation. Next, we need to plot the circle with a radius of 1 AU around the center of the graph, so we'll write a function to generate a basic circular orbit and plot it onto a 2D plane. To evolve a simulation, we'll need to define a timestep, which is how much the simulations evolves at once. We'll use 1000 as the timestep, which translates to 1000 steps over the course of 10 years. """returns x step & acceleration"""
…Something went wrong. 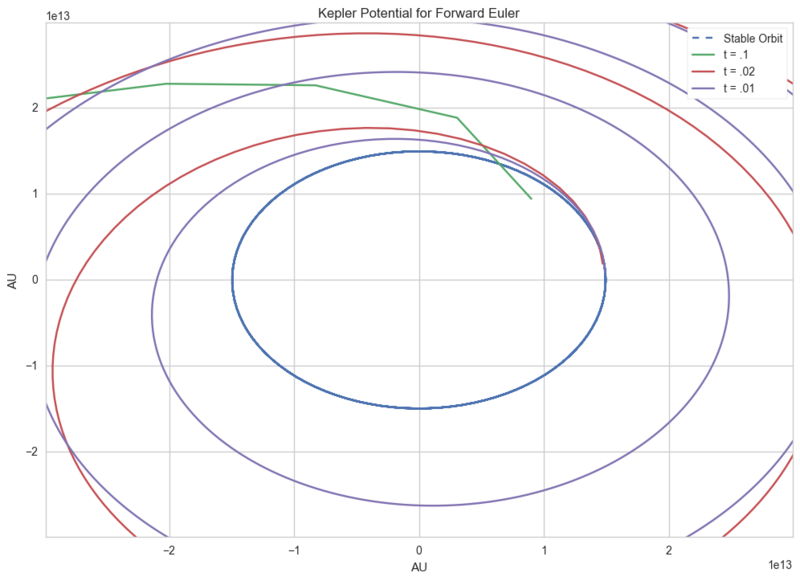 The forward Euler method is telling us that the Earth's orbit should spin out of control within 10 years, even less if we're taking bigger timesteps! This is much closer to what we want, but there's still noticeable phase errors on the simulation. The errors are caused by the inherent linear-ness of the Euler methods, we're getting pretty close to it, but we need to go an order higher to get more accurate simulations, which is what I'll talk about at another time. The Earth's orbit is actually ~0.0167, but we'll pretend it's 0 to keep things easy on ourselves. I chose these timesteps because they were easily 10/1000, 10/500, and 10/100. Feel free to experiment around with smaller and larger timesteps.